Three separate, private bungalows surround the pool and tropical gardens, all with fantastic beach views, 100 steps to 7 miles of nearly deserted beaches. Each bungalow is private, with your choice of a king or 2 twin beds. The fully equipped kitchenette in each bungalow (sink, stove, refrigerator) is great for cooking up the fresh catch of the day and palapa porches with open-air dining and hammocks makes for the perfect place for recharging after a day in the sun. Experience the relaxation of the outdoor shower and copper soaking tub for two under the stars, as the waves break on the shore. Contact us directly if you would like a special rate on more than one casita/bungalow. Guests give us A+ reviews for comfort, relaxation, adventures and the many connections to activities which we happily provide free of charge . . . we want you to have a fabulous vacation . . . our guests say this is indeed tropical paradise, and most want to come back as soon as possible. We are very well connected to the joys of life here in the Baja. Come along and experience the Baja! Hello! My name is Jayme, my husband, Kelly and I are the proud owners of the Baja Beach Oasis (BBO). After visiting Elias Calles neighborhood in 2017 we knew we wanted to make our home there. We are here to ensure your vacation is the most enjoyable and memorable vacation, of all time! We look forward to welcoming you to BBO! Baja Beach Oasis is located in the serene Colonia of Elias Calles, with nearly 7 miles of nearly deserted beach, it is a liberating change from the "hustle and bustle" of everyday life. With nearby villages and towns, our home offers guests the opportunity to enjoy the local vibe, authentic food, art, and more! Baja Beach Oasis is well equipped for the perfect vacation with an outdoor shower & copper soaking tub--for two, an oasis at every turn, relaxation is impossible to resist. Located steps from the beach this solar eco-retreat is perfect for those who are adventurers & seekers of serenity. Tranquil outdoor shower and outdoor soaking tub--for two! Steps from the 7 miles of nearly deserted beach. Pebble tech swimming pool. Easy access to nearby towns and villages. Kitchenette (stove, refrigerator) and sink & half bath (sink & toilet) each casita. Palpa porch covers the front of each casita. Beach towels, chairs, coolers, and umbrellas are offered to all paying guests of Baja Beach Oasis. Each casita has an indoor half bath (toilet and bathroom sink), access to the outdoor shower, outdoor tub & indoor full guest bathroom attached to the first floor of the main house. Only 100 steps from Baja Beach Oasis, to the beach! Day or night relax and allow the sounds of the Pacific Ocean, Oasis and estuary lull you to sleep. The solar-powered property offers 360 views of the hidden rural beauty of Mexico complimented by the neighboring palm grove estuary, beach, and Sierra Mountains. Each eco-bungalow offers breathtaking views of the beach & ocean located only 100 steps away! Enjoy your morning coffee/tea or fresh squeezed orange juice while watching the wildlife play. Only 100 steps from the beach! Take a hike, or watch the pastel sunrise over the peak of the Sierra mountains. Located east of Baja Beach Oasis, many believe the mountains share an "energy" that draws many guests to return. Wifi internet is the best available for this remote area at this time. The signal is strongest near the main house. Please download any movies, games & large files prior to arrival. Bath towels, washcloths, hand/face towels, beach towels are all provided. In Mexico, much of the living space is outside. The property offers many common areas for resting and catching up with family and friends! Tea kettle and french press provided. Don't forget to bring your coffee! Fully stocked kitchenette contains everything (cooking utensil, pots, pans, salt/pepper, cooking oil, silverware, plates, cups, bowls) you need to cook up your fresh catch of the day! We are happy to arrange for authentic Mexican meals prepaid with organic and fresh local ingredients per your request. Baja Beach Oasis offers an ever growing and constantly changing library from books donated by our previous guests. 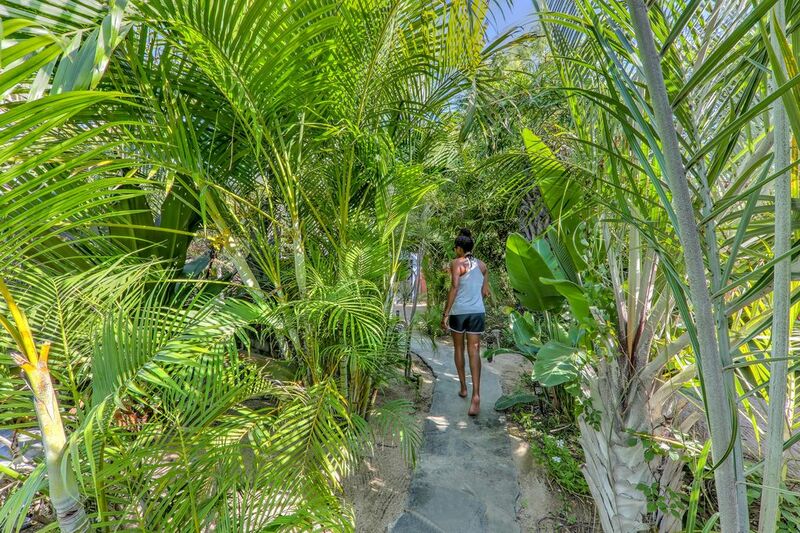 Many of our guests enjoy wandering the oasis and discovering the surrounding plants, vegetation and tropical fruits. Two of the three eco-beach bungalows offers a hammock for reading, relaxing and/or resting. All Beach bungalows offer a front porch seating area with bistro table, chairs & complimentary ocean views. Ashtrays available. Smoking outside only please. Among the Oasis, is the newly pebble teched pool. The pool is only offered to guests of Baja Beach Oasis. Soak worries, troubles, aches and pains away in the popular copper soaking tub, under the stars while listening to the waves crash on the shore. This tub is conveniently built for 2 people. My sister and I had a fantastic stay at Baja beach Oasis, and have promised ourselves and Jayme that we will be coming back! The place is simple and simply perrrrfect! Love that it is sustainable (water, compost etc...), because if we don`t take care of this beautiful place, it won`t be an Oasis anymore. Thank you for choosing Baja Beach Oasis & thank you for the kind 5-star review. It was our pleasure hosting you ladies. We look forward to welcoming you back, soon! 100 steps to an all but deserted beach. Beautiful gardens and an impeccable host. The setting is tranquil and friendly. The pool is divine and the outdoor shower was heavenly. Very quiet with gorgeous sunsets and plenty of amenities. The hosts were excellent and we had a great time. This truly is a little desert-beach oasis. It's rustic setting is perfect for this undeveloped stretch of gorgeous beach. A swimmable/surf-able beach is a mere 10 minutes away by car, and great dining is 15 minutes from our casita here. In other words, you can feel like you've gotten away from it all (except the WIFI is excellent) and be in the thick of the beach scene in a short drive. We will certainly return. Fantastic beautiful location and very gracious hosts. The property is on a gorgeous 7 mile beach with nesting turtles and no people. Private and cozy and very comfortable. We will definitely be back. A perfect relaxing vacation spot. We could not have asked for more!! Thank you for the 5-star review! We are so grateful that you stayed with us and greatly appreciated your feedback, we have almost completed the in-house guidebook! Come back soon so we can add your favorites (dining experiences, shopping, etc.) to the book! The casita was quiet, clean, well stocked, relaxing and very comfortable. The surrounding area is magnificently beautiful. There's basically nothing and no one around. Bring food & beverages from Cabo for breakfasts and lunches. Lots of excellent restaurants 10-20 minutes by car away for dinners. Jayme and Kelly were gracious and helpful. Thanks so much for a rejuvenating vacation! Baja Beach Oasis is located 30 minutes north of Cabo San Lucas, 20 minutes south of Todos Santos and only 10 minutes from the world famous Cerritos Surf beach. With nearly 7 miles of the pristine deserted beach, neighboring palm grove estuary and the breathtaking views of the Sierra mountains it's "no-brainer" why guests return year-after-year to seek serenity. Over the years, guests have arranged for (off-site) activities such as: whale watching, snorkeling, scuba diving, surfing (lessons), swimming with whale sharks, swimming with sea lions, temazcal ceremony, horseback riding, deep sea fishing, shore fishing, mountain biking, hiking, spa services offered in and out of house (massage, facial, manicure, pedicure and more! ), traveling to the Sierra mountains to visit the our local potter, paddle boarding, private island tours, eco-tours, stand-up paddleboard tours, kayaks and pretty much whatever you can think of! After a day filled with exploring the nearby towns, villages and fun-filled activities many guests enjoy the privacy, authenticity, "low-key", tranquil vibe Baja Beach Oasis offers. Authentic Mexican meals may be purchased prior to arrival and are prepared with all natural ingredients from the local farmers by our local chef and delivered to your bungalow. Other meals and activity options are available. Please visit contact the host for more information. We look forward to welcoming to Baja Beach Oasis and the Baja vibe with one of our handcrafted, fresh-squeezed citrus margaritas!